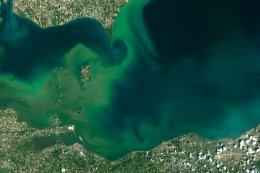 Waves of green are rolling onshore in western Lake Erie as another monster algal bloom grows, fed by nitrogen and phosphorus-rich runoff from the farmlands in Ohio and Indiana. 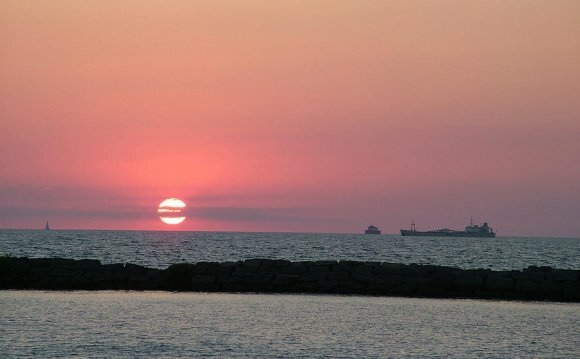 Scientists have been predicting trouble for western Lake Erie since early July. 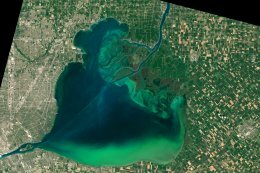 NOAA’s algal bloom models have been predicting this summer could deliver the most severe bloom in recent years for the lake, “and could become the second most severe behind the record-setting 2011 bloom.” The algae produces a toxin called microcystin that, in early August of last year, reached such critical levels that residents in Toledo were told to not drink their water, even if they boiled it. 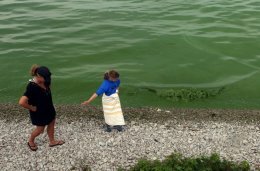 The toxic algae feeds off of nutrients that run into Lake Erie from the Maumee River, which snakes through the farmlands of Ohio and Indiana. The runoff from these farms contains nitrogen and phosphorus, which sends the algae in Lake Erie into overdrive. No doubt an extremely wet June and July in the Midwest increased this toxic runoff. High resolution satellite imagery from late July showed the green plume of algae spread east of the islands north of Sandusky Bay, with the highest concentrations in the far western portion of the lake, and in southern Lake St. Claire, which connects Erie and Huron. Avoid swimming, power boating, water-skiing, jet-skiing and tubing in algae water, which can whip up the toxins and create aerosols of droplets that can be inhaled or ingested. Keep your pets out of the water, too. Skin contact with algae toxins can cause rashes, hives, or blisters. Breathing toxic mist from the lake can cause runny eyes and noses, a sore throat, asthma-like symptoms, or allergic reactions. Swallowing toxic-laden water can cause severe diarrhea and vomiting, abnormal liver and kidney functions, and neurological problems such as weakness, salivation, tingly fingers, numbness, dizziness, difficulty breathing, and under the most extreme circumstances, death. If you come into contact with contaminated water, rinse off with clean, fresh water as soon as possible. Pets that have been swimming in an area with toxic algae could ingest significant amounts of toxins just by licking their fur after leaving the water. Thoroughly rinse of your pets with clean, fresh water. Making of "The lake series"